At Work of Art Jewelry Studios we have one key philosophy: that each piece of jewellery designed, manufactured and sold by us, is an investment in a piece of art. 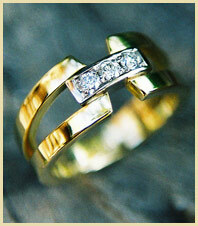 We are passionate about jewellery and what it symbolises in each individual’s life. Every design requires that the artist displays special skills in bringing to life all your desires. The successful creation of every piece of jewellery, depends on the dying art of master craftsmanship in the choice of stone and forging of the metal. Special moments of love and life are captured in these pieces and they become an everlasting symbol that can be carried over to generations to come. Find out all you want to know about buying diamonds: size, carat and clarity. Customized cuff links, pendants, bracelets, pens and more for your company. How to get the right size for his or her finger.